Quadratec's QR3 heavy duty front tubular bumpers are available in three distinctive styles that mount directly to your Jeep® frame with included hardware and detailed instructions. Our front bumpers are contoured to the vehicle for a perfect custom fit. 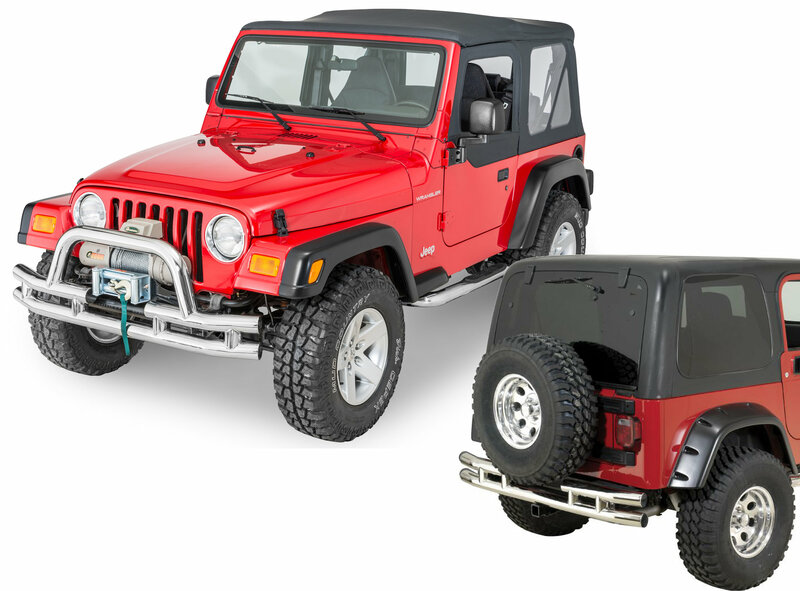 Winch mount front bumpers feature a welded center hoop. All winch models require an optional winch plate that can be used with most winches including all Q-Series Winches. The durable powder coat finishes feature e-coatings for superior adhesion and corrosion resistance and are available in gloss black or textured black. The QR3 heavy duty rear tubular bumpers are the perfect companion to any QR3 front bumper and side bar combination. Rear bumpers feature a cutout to accommodate spare tires up to 33" in diameter. The popular hitch version features a separate frame mounted 2" receiver style hitch with a 2000lb. towing capacity and a 200 lb. tongue weight. Receiver hitches work with all your hitch mounted accessories like bike carriers, cargo racks and of course, towing. Our rear bumpers feature mandrel bent 3" diameter tubing that's .07" thick. The durable powder coat finishes feature e-coatings for superior adhesion and corrosion resistance and are available in gloss black or textured black. Powder coat finishes carry a three-year limited warranty while our beautiful show polished stainless steel versions carry a limited lifetime warranty. The QR3 heavy duty side steps are the traditional design that incorporates tough non-slip nylon pads making it easier and safer to get in and out of your vehicle. Our side steps are custom engineered to fit your Jeep® with an easy no drill installation using frame mounted brackets. Our side bars feature mandrel bent 3" diameter seamless tubing that's .07" thick. The durable powder coat finishes feature e-coatings for superior adhesion and corrosion resistance and are available in gloss black or textured black. Powder coat finishes carry a three-year limited warranty while our beautiful show polished stainless steel versions carry a limited lifetime warranty. Custom made specifically for the Jeep® Wrangler by Quadratec. Supports winches with the common 10" x 4.5" bottom bolt pattern. The 1/4" thick one piece carbon steel design is e-coated and finished in satin black powder coat for lasting durability. All necessary mounting hardware is included along with detailed instructions. For use with original equipment bumpers only. Introducing the first winch designed and engineered specifically for your Jeep®. All Quadratec Winches are manufactured in our state of the art ISO 9001 factory and are CE certified for our international customers. The Q9000 provides all of the capability that most enthusiasts will ever need for occasional use on their Wranglers and CJs. Now you can take advantage of Quadratec's massive purchasing power to get the lowest price of any winch in this class. Our engineers work directly with the factory to provide solutions which are specifically tailored to your Jeep®. Our powerful 4.8hp series wound motor and class leading low gear ratios give fast line speed with a Battery Friendly low current draw. You will get the most winching time from your available state of battery charge. We give you an industry best Limited Lifetime Warranty on mechanical parts and a 1 year Warranty on all electrical components. Detailed installation instructions and a handy glove compartment sized Owners Manual with Winching Guide are included. All Q Series Winches include two sets of solenoid brackets for side mounting or top mounting. *** Gear Reduction to 1, otherwise known as the "Gear Ratio". A higher numerically gear ratio will provide slower and more powerful pulling while also providing the least amount of amp draw on your battery because the winch motor doesn't need to try as hard. A lower numerically gear ratio will pull faster but also put more amp draw on your battery. 15 Galvanized Aircraft Cable 100' x 3/8"